Among the most important issues raised by the proposal is where the traffic that is diverted from 42nd Street will go and how the delivery of goods and refuse removal will be handled. These issues have been addressed in a technical study of traffic by Sam Schwartz, PLLC, commissioned by vision42 in 2004 through a generous foundation grant from the New York Community Trust. The detailed analyses and solutions contained in this study are available via the above link. In many ways, creating an auto-free street is largely a political, rather than a technical decision. A main stumbling block to the reintroduction of light rail in New York has been a reluctance to take any street space away from automobiles. In Manhattan, where only 23% of the households even own cars, perhaps a different set of priorities ought to obtain. 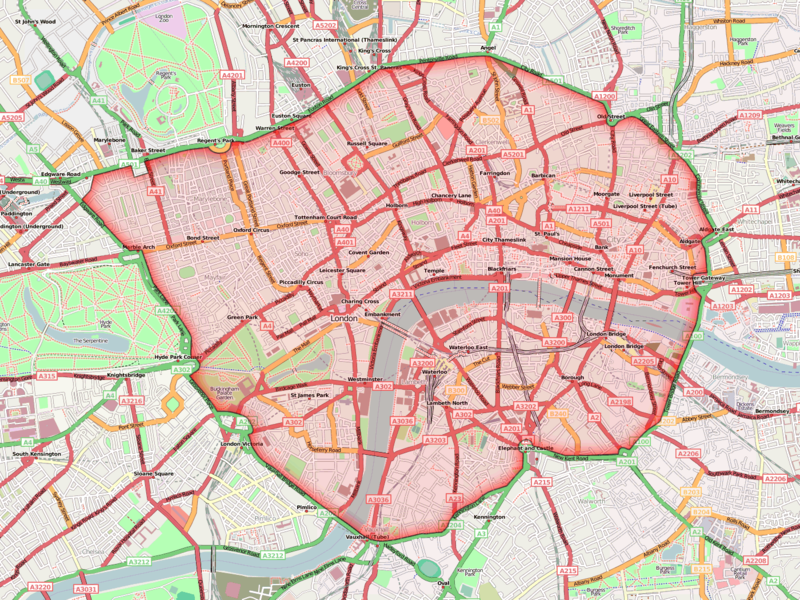 The map above shows the congestion pricing zone in Central London, which is the approximate size of Manhattan south of 60th Street. This highly successful program has resulted in the reduction of traffic by 30 percent, and in motor vehicle delays by 30 percent. Until New York adapts a similar system, mid-Manhattan will continue to be plagued by oppressive and dangerous traffic. None of the traffic volumes on 42nd Street are very high; they only appear to be because traffic moves so slowly on the street. The absence of turns onto 42nd Street should actually improve the traffic flow on the avenues through the intersections. The controlled delivery of goods and refuse removal can be handled much as they are within other pedestrian precincts, such as Grand Central Terminal, Rockefeller Center and the South Street Seaport. Freight entrances for most of 42nd Street’s large office buildings are located on 41st or 43rd Street, since ground floor rents on 42nd Street are too high for this function. For handcartable deliveries, nearby truck parking spaces on adjacent avenues will need to be carefully reserved. For more substantial deliveries, trucks can be allowed entry at controlled times. Similarly, access to hotels and a few existing parking garage entrances can be accommodated. In fact, the reality is that, when streets are closed, not all the traffic relocates to other streets. A number of careful studies have been done before and after street closures. 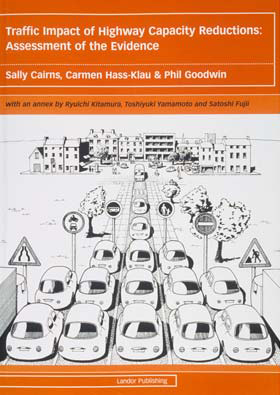 The book whose cover is illustrated here — Traffic Impact of Highway Capacity Reductions, by S. Cairns, C. Haas-Klau & P. Goodwin (Landor Publishing, London, March 1998) — details studies of over 200 cases of street closings around the world, where the predicted congestion on adjacent streets actually failed to materialize. Much of the traffic simply disappeared. And this was passive shrinkage, not shrinkage by the deliberate pricing of tunnels and bridges. It is also likely that, when a free-flowing transit line, operating in a dedicated right-of-way, is introduced at the same time as a street closing, even more former motorists will be diverted to its use.